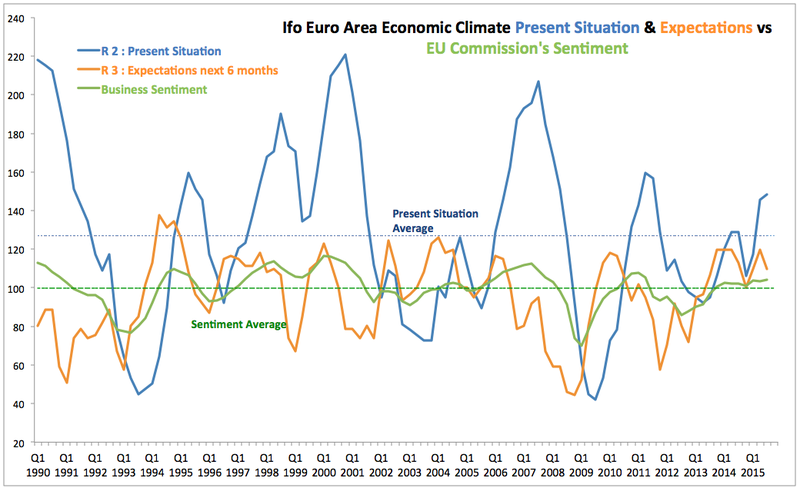 Latest Ifo Index of Economic Climate for the Euro Area fell from 129.2 for 2Q 2015 to 124.0 for 3Q 2015, running ahead of 118.9 reading in 3Q 2014 and at the second highest level since 4Q 2007. Present Situation Index reading, however, is up at 148.3 in 3Q 2015, compared to 145.5 in 2Q 2015 and 128.7 in 3Q 2014. The index is at its highest reading since 4Q 2011. Overall, based on Present Situation assessments, 1Q 2015 - 3Q 2015 activity (average of 137.1) is running below the levels of activity during previous expansionary sub-cycle of 1Q 2011 - 3Q 2011 (average of 152.9), suggesting weaker growth conditions in the current recovery phase than 4 years ago. Expectations for the next 6 months period Index slipped significantly in 3Q 2015 to 109.8 from 119.7 reading for 2Q 2015 and matching rather poor expectations reading recorded in 1Q 2015. The Index is down on 3Q 2014 when it stood at 113.1. Over the entire 2015 to-date, the index has averaged 113.1 against same period average of 117.5 for 2014, and identical to 113.1 average for the same period of 2011. 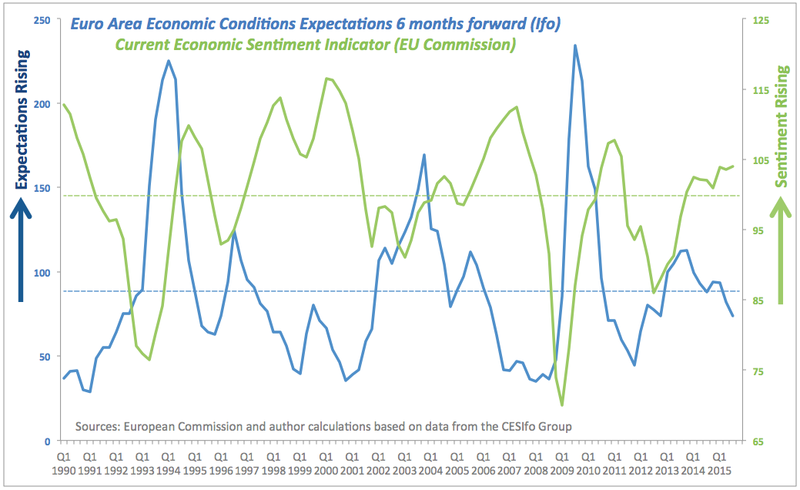 On expectations basis, there is weak optimism among survey participants in growth conditions forward. Expectations Index gap to Present Conditions is currently at 74% compared to 82.3% in 2Q 2015 and 93.4% in 1Q 2015. This suggests overall deepening gap between current assessment of economic situation and forward expectations to the downside on forward expectations. Still, judging by 6mo lags, current conditions continue to turn out better than previous expectations of the same would have implied, with 6 mo lagged expectations index under-shooting forward 6 months reading for actual conditions by 38.5 points. 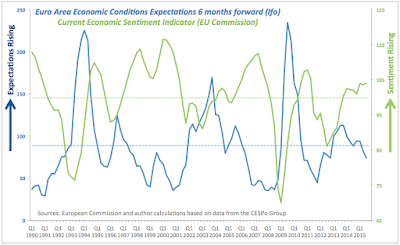 Expectations Index (6mo forward) suggests weaker conditions expectations in the future and remains consistent with poor producers' expectations prevailing from around 4Q 2013 on. Current situation assessment, meanwhile, is improving, but remains relatively weak and only most recently (2Q-3Q 2015) reaching above historical average line. 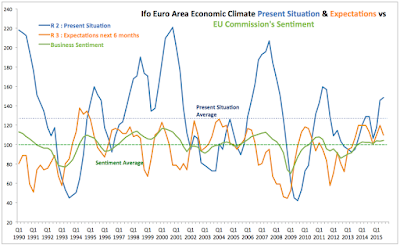 Current economic sentiment published by the EU Commission has now been diverging from 6mo forward expectations published by Ifo for the period starting from 4Q 2014, with expectations being reported by Ifo running more subdued (and worsening) than EU Commission reading of current conditions. 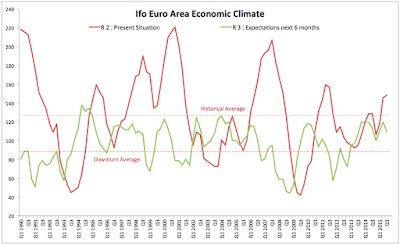 Despite being more optimistic than Ifo Expectations, and despite running above its own historical average, the EU Commission Sentiment Index remains rather subdued by historical standards. In simple terms, things are getting better, but these improvements appear to be more on the surprise side, rather than structural side.